Samsung has been making a big push into curved screens and it looks like it's paying off, as the company is thought to be ditching flat screens altogether for the Galaxy Note 7. 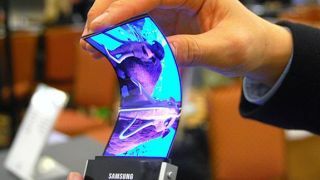 But curves are just the start - the next step is flexible, foldable screens, and a new pair of patents could bring the company one step closer to making them a reality. One of the big challenges of a foldable phone is not making the display itself fold – prototypes with foldable screens have existed for years – but making it fold without damaging any components. These patents address exactly that. Dug up by ETnews, the first patent describes an "artificial muscle", taking the form of a set of connected plates, which would move in time with the screen bending and gently moving to protect any components which could otherwise be damaged. The second patent is for a flexible display separated into a top and bottom section, which could be folded in the middle using the artificial muscle in the join between them to allow it to fold. It's reminiscent of another folding phone patent we recently saw from Samsung, so it's clear the company is putting a substantial amount of thought into the concept. With the problem of damaged components potentially solved we might start seeing phones like this before long. In fact, it's already been rumored that Samsung plans to release two folding phones next year. Will the Samsung Galaxy S8 be one of them?